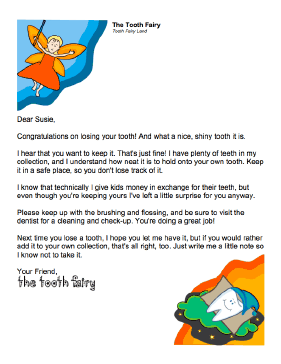 When a child wants to keep his or her tooth after it falls out, this letter from the Tooth Fairy explains that it's just fine to do so. Congratulations on losing your tooth! And what a nice, shiny tooth it is. I hear that you want to keep it. That's just fine! I have plenty of teeth in my collection, and I understand how neat it is to hold onto your own tooth. Keep it in a safe place, so you don't lose track of it. I know that technically I give kids money in exchange for their teeth, but even though you're keeping yours I've left a little surprise for you anyway. Please keep up with the brushing and flossing, and be sure to visit the dentist for a cleaning and check-up. You're doing a great job! Next time you lose a tooth, I hope you let me have it, but if you would rather add it to your own collection, that's all right, too. Just write me a little note so I know not to take it.